Every once in a while I get a serious hankering for Thai food. While it's pretty easy to whip up a decent curry at home using Maesri curry paste and a can of coconut milk, I am not going to fuss with frying up spring rolls and making soup, too. (I like a soup-to-nuts experience when I eat Asian food. I want to experience as many flavors and textures I can.) Mr Minx and I were originally going to drive downtown to Banthai, but then Liz reminded me about Thai One On in Towson. I'd been there before, mostly to get sushi. Although the food is good, the sauces can lean towards the too-sweet side, as is the case with the homemade teriyaki they use to top some of their sushi rolls. I had the same problem this time, but I'm going to blame it on the choices I made. 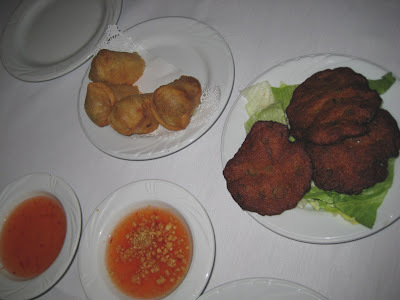 We started off with appetizers - spring rolls and tod mun pla, or fried fish cakes. I can't help but compare all Thai food to that of the late great Bangkok Place, where the spring rolls were slender and delicate and the tod mun pla were addictively tasty. Thai One On compared mostly favorably - the apps were admirably non-greasy, and although there was more surface area on the fish cakes than I like (they were a bit too flat), they had a nice kick of heat to them. We then had soup - tom kha gai for me, and tom yum kai for Mr Minx. I did not photograph them because the soup had slopped over the edge of the bowls and looked terrible. Both were pretty standard, the tom kha on the sweet side, the tom yum on the spicy side, and both were loaded with hunks of white meat chicken. 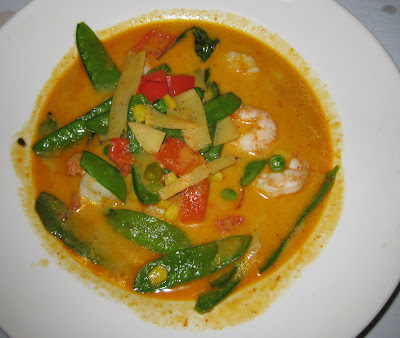 For my entree, I decided to try their red curry with shrimp and vegetables. 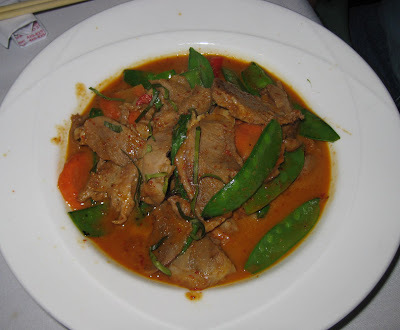 I loved the red curry at Bangkok Place - it was incredibly aromatic and only slightly sweet. For the most part, every other red curry I've eaten has been very sweet. One I had in a trendy Seattle restaurant was practically a dessert topping, it was so cloying. Thai One On's was also sweet, not obnoxiously so, but following the sweet, coconut milk-laced tom kha and coupled with the Thai iced tea I was drinking, I felt queasy at the end of the meal. Mr Minx had no such issues with sweet. His Penang Ped, or duck in penang curry, was not at all sweet and completely incendiary. And delicious. The duck itself was tender and had vague lemongrass flavors, and the sauce was a fiery, fishy delight. Even had this dish been sweet, his soup was sour, so he would have had balance. Unlike stupid me who ordered unwisely. The waitress seemed incredulous that we didn't want dessert after we finished three courses. More sweetness and I would have needed a barf bag. So, to sum up - when dining at Thai One On, don't order Thai iced tea, tom kha, and red curry in the same meal. Do order tom yum and penang ped. I'm sure other stuff is good too - we'll just have to go back and check it out sometime in the future.